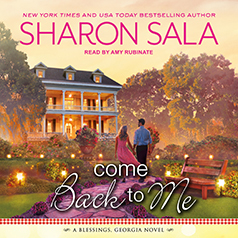 Sharon Sala presents the sixth book in her Blessings, Georgia, series. After a devastating fire pitted their families against each other, high school sweethearts Phoebe Ritter and Aidan Payne were torn apart. Twenty years later, Aidan is called back to Blessings, nervous about confronting his painful past. And that's before he knows about the nineteen-year-old secret Phoebe has been harboring all this time. As Aidan tries to make up for lost time with the family he didn't know he had, Phoebe and Aidan rediscover long-suppressed feelings. But the past won't lie buried, and old enemies threaten to destroy the peace they've fought so hard to find.